On the homepage of your SessionLab account – i.e. on your dashboard – you can have a set of options how to organise the content you and your colleagues created in SessionLab. Every SessionLab user has access to a Personal workspace by default. Imagine the workspace as a root folder that contains all the sessions and library resources and templates you create in the application. When you are invited to a Team as a team member, then you also get access to the workspace of that Team, which allows you to see all the sessions, library resources and templates of that Team. Recent view (https://app.sessionlab.com/recent): shows session from your whole SessionLab account, both from your Personal and Team workspaces (if you have one). This view only displays your 24 most recently modified sessions. The folders you may created in your Personal and Team workspaces are not displayed here, and you also cannot create folders while being in the Recent view. It is just a shortcut to access your most recent sessions. Personal view (https://app.sessionlab.com/personal): Every SessionLab user has a Personal workspace by default. If you are not member of a Team account, then all your sessions are created here. You may create folders within your Personal workspace to organise your sessions. Team view(s): If you are invited to a Team account, you get access to the workspace of that Team. If you are a member of a Team, the default workspace where your sessions get created is your Team workspace. If you are in the Recent view when creating a session, then it will be created on your Personal workspace if you are not a member of any team, but if you are a member of a team, then the session is getting created under the Team’s workspace. In terms of access rights, all content on your Personal workspace is visible only to you by default (until you don’t share specific sessions with other users), and all content on your Team workspace is visible with viewer rights to all members of the team. Next to the default grid layout to display the sessions on your dashboard, you can choose to switch to a list layout to display your sessions and its main details in a list view. In the list layout your sessions are shown in a table, so it becomes easier to have an overview of your sessions at one glance. Folders are allowing you to group sessions together and structure your workspace. 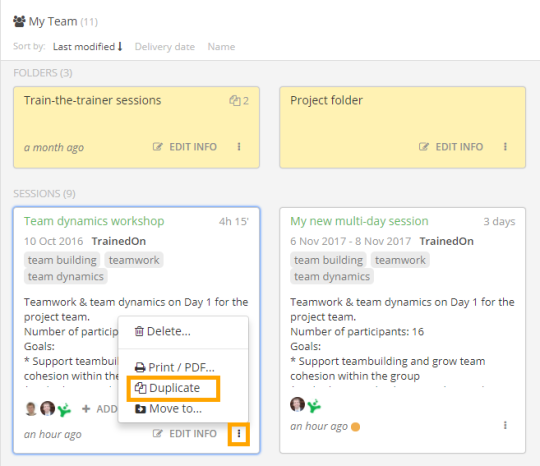 Viewing and creating folders is available in the Personal and Team workspace views. There are various ways to rename folders are sessions. If you want to do it on the Dashboard, then click on the Edit Info button of the folder or session (in grid view). The Edit info button will only be available for the folders and sessions where you are the owner or you have editor rights. The same renaming option is also available in list view, with the exception that you cannot edit the session description since it is not displayed in list view. Nonetheless, you can adjust the name, date, client and tags of the sessions, and the name of folders. How to duplicate a session? Have you ever wanted to create a copy of any of your previous sessions, so you can use it for a new session design without compromising the original version? You can do it easily on the dashboard. Workspaces and folders – Where do my sessions get created? As a Basic or Pro user of SessionLab, you have access to one workspace: your Personal workspace. As a consequence of this, all the sessions you create will automatically be created in your Personal workspace. If you create a session while being in the Recent view, the session will automatically be placed in the root of your Personal workspace. If you create a session while being in a folder in your Personal workspace, then the session will be created in the folder. Don’t worry, you can easily move your session within your folder structure, see below in the section about moving sessions. 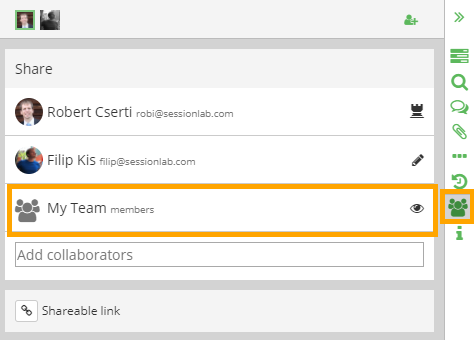 If you are member of a Team account in SessionLab, then you also get access to the Team’s workspace, beyond your own Personal workspace. In this case, if you are in the Recent view, the default workspace where your sessions get created is your Team’s workspace. If you are not in the Recent view, but either in your Team’s or your Personal workspace, or any of their subfolders, then the session you create will get created at the workspace and folder where you were located when pressing the New Folder button. How to see which workspace does a session of mine belong to? If you are within the view of your Personal or Team workspace, then naturally you only see the sessions belonging to that workspace. However, you might ask, how do I know which workspace does my session belong to, if I am in the Recent view or if I have already opened the session? 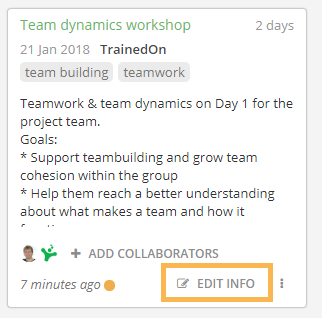 Sessions under your Team workspace are visible to all members of your Team account. 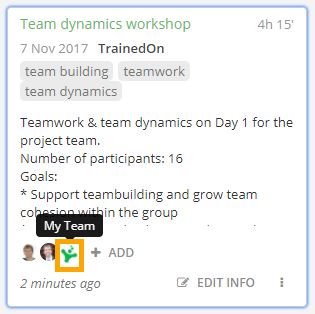 You can see on the screenshot above that this session belongs to the workspace of “My Team”, and therefore all members of the team account has the right to view this session. How to move sessions and folders? 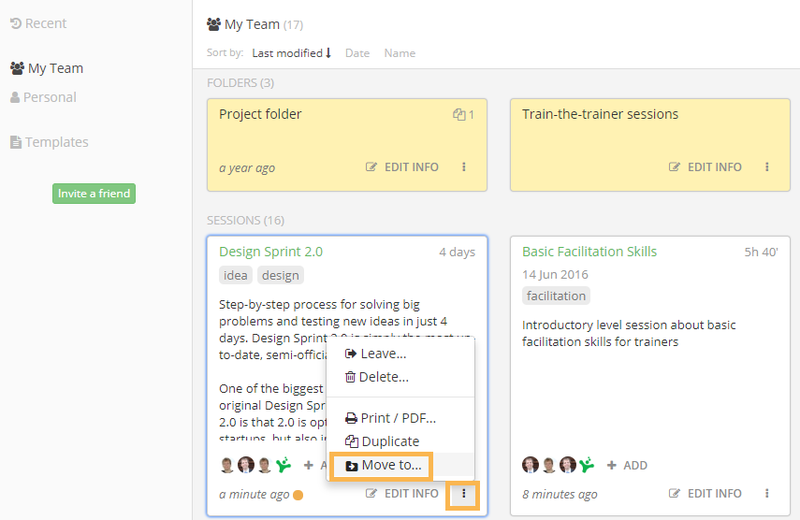 You can move sessions between from one folder to another (or from one workspace to another) by clicking on the More options icon on the session card, clicking on Move and selecting the destination folder. Similarly, you can also move folders between workspaces or into another folder within the workspace, as long as you own the sessions within that folder. 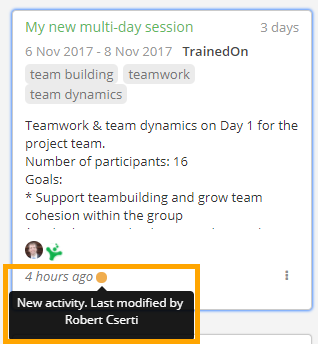 You see the Activity Indicator if you session has been edited by anyone else since you last opened it. Was this article helpful? If not, talk to us.